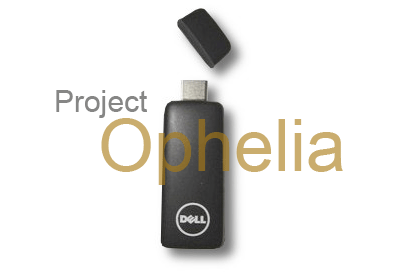 Dell’s Project Ophelia seems to be “something big” to me. All you need to do is find a screen (TV or monitor works) with HDMI port and plug this tiny thing, voila! every document, presentation etc that you need to access, is right in front of you!! 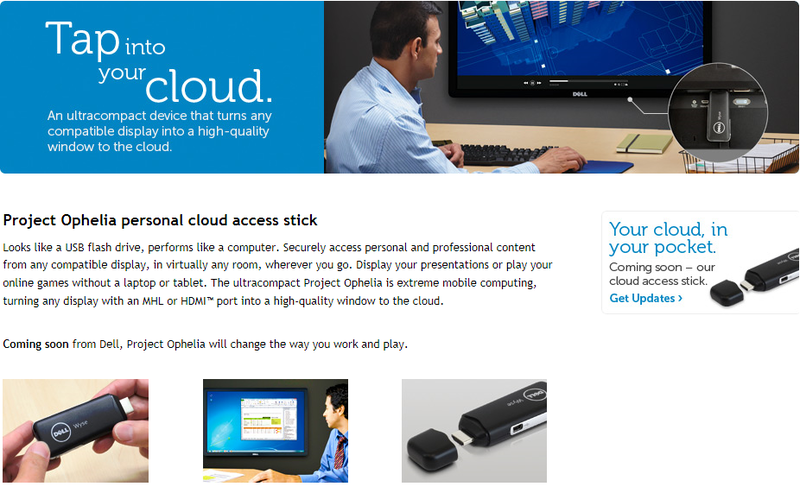 Project Ophelia can connect to the web as well, so it’s totally like having a virtual office, anywhere you go. Well, I know it’s based on Android, although I still can’t see Android operation system being used as a business OS yet, unlike Windows, but it’s still a cool idea nevertheless. Inside this device is Rockchip RK3066 (1.6 GHz Dual- Core Cortex-A9) and 1GB of RAM. Its been said that Rockchip RK30066 performance is similar to Samsung Exynos 4 Dual-Core chip, so it seems pretty good. Wifi and Bluetooth connectivity are also available alongside MicroSD card slot for additional storage. OS? well it probably runs on Jelly Bean, but still unsure because it hasn’t been released to market yet. Beta testing, they says. Tiny USB-style PC, just like one of those things you will have if you are a spy! Wait, that’s the problem right there. You know how easy it is to lose USB right?? I had lost like a dozen of USBs in the past year, I don’t even want to know what’s in it or I will be freaking out my entire life. On the other hand, business people would be more concerned on “what if this get stolen?”. Fortunately, security is something all manufacturer would worry about. Security, is something I am very concerned about too. In this era of Big Data, the term “sharing” is somehow seems dangerous, especially knowing that Project Ophelia device is based on cloud storage and I don’t believe in cloud storage security, yet. Turns out, Dell uses Wyse Cloud Client Manager software to securely access and share, this would be essential for business enterprise, because they will be able to manage permissions or access to Project Ophelia devices, based on role, department or location. Mr.IT Guy would be in charge of all Project Ophelia devices so when you lost your device, all you need to do is tell him to delete all data inside your device, remotely. Security wise, it seems secure enough.